I’m excited for this post because I’m going to bring you behind the scenes in my Spring capsule wardrobe planning and show you what I have purchased so far, as well as give you my free guide I created that helps you start one of your own! Let’s dive on in! First, let’s talk about how I go about figuring out what I want to wear for the warmer months where I live (basically April-October here in the South.) I know I like to wear two uniforms: denim cutoffs or ripped denim + a tank/graphic tee/pretty blouse, and a dress + cute sandals + pretty jewelry. That’s my comfort zone and what I reach for time and time again. So when I go to shop I look for pieces that work within these uniforms, and then I stick to the colors I like to wear most often (usually neutrals, with some small pops of color.) There are some outliers that I’ll add in for fun (maybe a patterned pair of palazzo pants, or a frilly skirt), but 95% of my capsule are clothes I can wear over and over again and style a bunch of different ways. It is also REALLY HOT here, so I need to feel really comfortable and not be fussing with extra clothes or accessories! (Left) Old Navy slipdress, and (right,) Old Navy fit and flare dress. I love these two dresses! I’m probably obsessed with them? I love a really simple, basic dress to wear for the summer months. I don’t want them to be fussy or hard to wear, and I like if they can transition from errands with the kids to a date night (if I ever go on one lol.) I bought these during Old Navy’s 40% off sale and I fell in love with both of them. These aren’t exciting buys, but they will be worn multiple times a week and become true workhorses in my closet. 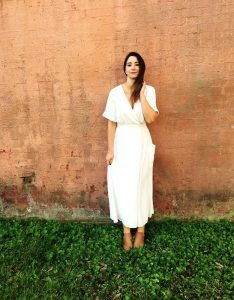 I also love a white dress as well, I am lookng at adding this maxi dress to my collection, and I have one very similar to this that I have worn and loved for two years now! This olive colored dress is on its way to me from Target, too. I can’t wait to try it on. Woven slip on mules, Free People dupe slip ons (about $120 cheaper than the super popular ones I have been eyeing!) white slides. Shop this full look HERE. Target has been KILLING it lately in the shoe department. My favorite brand there is the Universal thread one! I picked up these shoes because I know they will go with EVERYTHING, and I love having multiple, inexpensive shoe options to switch things up. As you can see, I really like neutral shoes, they really go with everything. They are all TTS, I am wearing a size 8. I am thinking of adding these wedges that I wanted to buy all last Summer (maybe for Mother’s Day tbis year? ), and these flat espradrilles from Target are so cute. Stella and Dot just came out with their March arrivals, and I LOVED them. I was sceptical at first about their clothes, but after ordering a poncho a couple of months ago I am sold, they are SO good and sell out constantly. I ordered the Carlie versatile poncho in Navy and the Addy versatile poncho in light gray. I think these will both look great both with jeans and cutoffs (one of my uniforms), I ordered a size small and was thrilled with the quality when they came in the mail. I also ordered the reversible Botanical chandelier earrings (top right in middle picture), and the palm print earrings. You can shop them all HERE, or just comment and I can help you (I am a Stella + Dot stylist!) I am truly obsessed with their jewelry first, and clothing second, and bought continuously each season from my friend before just signing on as a stylist. I LOVE Stella + Dot! Also, can we discuss the cuteness of their camo clutch? The lining is also SO CUTE! I also grabbed this v neck tank in white and gray, as well as this racerback tank in white and olive. You can never have enough basic tanks and tees! I seriously wear denim cutoffs almost every day of the week in the summer. I am always on the search for a great pair, and my sister-in-law turned me on to this brand of shorts. American Eagle has a great brand of jeans and shorts called Next Level Stretch (remember these pants I wore all winter long?) I ordered 3 pairs of their midi length shorts in a size 8 (I alays size up in this brand, I typically wear a size 4-6 everywhere else) and they fir AMAZING. I love the length, too, I don’t like super short shorts or having to pull at them every time I stand up. I returned one pair as I didn’t love the color, but kept this pair (wearing above) and this pair. And these shorts! I saw them on a blogger in Instagram and instantly fell in love. I ordered them in this olive color and in the chambray color and I LOVE them. I ordered a size up as I always do in this brand (medium), and they fit great. They are lightweight and look great with a simple tank or tee. I will wear these all Summer long. So that’s it for now! I still have stuff from last season that will carry over into my capsule. I am on the lookout for a camel tote bag, some neutral wedges, and maybe some fun printed palazzo pants? I like to grab a couple of things at the beginning of the season, then wait a couple of months and see what gaps I have noticed and shop from there to fill them in. P.S. If you want to know HOW to start a Capsule wardrobe/Curated Closet, you can sign up for my FREE guide below.